The reason more and more woman are choosing Organic Semi-Permanent Makeup is because it is safe, natural and looks like real hair! The 3D Feather-Stroke technique created by Natalie is precise and defined, giving you eyebrows you’ve always dreamed of having. The strokes created are micro thin( the diameter of actual hair) and placed perfectly in the direction of the natural hair growth. During the consultation, we choose a beautifully arched eyebrow shape and blend a unique custom color that best suits the desired outcome you are wanting to achieve. During the consultation, we will discuss any questions you may have regarding, shape, color, healing time and so forth. During the procedure, a topical numbing agent is applied so that you are comfortable and relaxed the entire time. Each procedure takes about an hour. The greatest benefit of having Semi-Permanent Feather- Stroke Eyebrows, is that you can go straight back to work immediately after your procedure. No swelling, minimal redness, zero downtime and easy after care. The results are waking up to a natural more confident you! The problem with using Permanent ink instead of Organic Semi-Permanent, is that it is made with metallic metal which enters the blood stream and can be toxic. After a while, the permanent ink oxidizes and changes color, and results are permanent. The reason why I love Organic Semi-Permanent Make-up is because it’s safe and only lasts about 6 months- 2 years. Another additional benefit is that we as women LOVE change. We change our hair color, style, and preferences all the time. Having something permanent on your face forever makes it feel like there’s nothing more you can do. 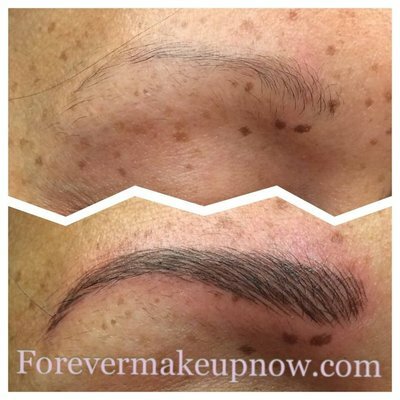 Having the option to make Eyebrows thicker or thinner with time, enables you to make adjustments to the shape and color of your desire. The 3D Feather-Stroke technique creation is one of a kind. Whether you are an all natural kind of woman, or dramatic, we discuss in detail how you want the end result to look. I listen closely and take the time to formulate my clients needs, preferences and desired look. Results are always beautiful and natural. No more pencils, no more wiping your eyebrows off, no more tinting. You wake up and are ready to walk out the door, saving you time and knowing you feel the most confident about yourself. When you and I come together, not only will you have your beauty enhanced, but your spirit as well. I love being a positive, motivational force in your life. It is with great joy to be able to uplift every person I come in contact with. I make my clients feel that their is something worthwhile in them and have them feeling uplifted, inspired and rejuvenated after a session with me. For a free one-on-one consultation, please call or complete the below reservation form.